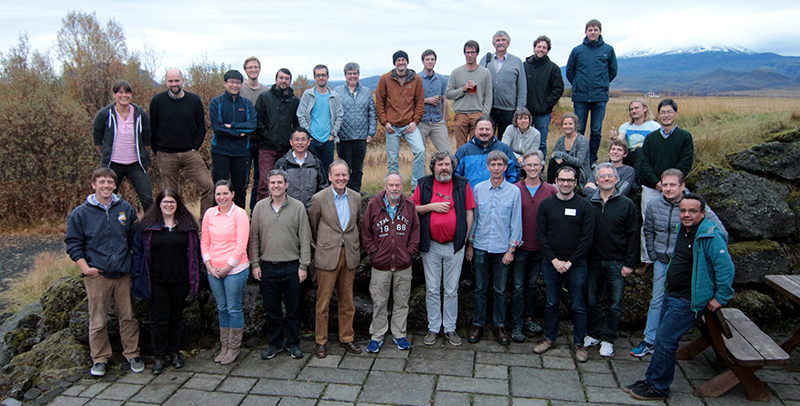 The 8th Nordic Paleomagnetism Workshop was the largest of its kind to date. It brought together 37 scientists from 14 countries with a variety of Earth sciences backgrounds to work on the paleogeography, paleoclimate, and paleomagnetism of the Phanerozoic and Precambrian, the Mesozoic geodynamo, and Earth’s magnetic field during the past 100,000 years. This year was Iceland’s first time to host the workshop. Nordic Paleomagnetism Workshops (NPWs) were initiated in 1986 with the goal of tackling problems at the forefront of paleomagnetic research by uniting Nordic scientists in the field to rigorously catalog, evaluate, and distribute a growing amount of paleomagnetic data. Over the years, the workshops have expanded to involve a number of international scientists, melding Nordic interests with those of the global community. This year’s workshop was no different, with scientists participating from the United States, the United Kingdom, Canada, China, South Africa, Germany, Estonia, France, Macedonia, and Brazil. NPWs also bring together young scientists and established leaders in the field to work together in small groups to address well-defined scientific problems and produce tangible results. An NPW takes place every 3–5 years at a secluded location in a different Nordic country. This year was Iceland’s first time to host the workshop. Participants were blessed with beautiful weather, revealing the full glory of the highly active volcano Hekla, which overlooks the meeting venue, as well as with opportunities to view the northern lights. Rapid advances in robust data generation bode well for increasingly accurate supercontinental and paleoclimatic reconstructions in deep time. Presentations spanned such topics as updates to global paleomagnetic and geological databases, plate tectonic reconstructions, geomagnetic field modeling, and the relevance of numerical dynamo simulations to understanding the long-term evolution of Earth’s magnetic field. As part of the group work, meeting participants compiled and evaluated paleomagnetic data from the Phanerozoic to shed light on paleogeography and climate. Notably, participants resolved the long-standing and enigmatic difference between North American and European apparent polar wander paths during the Jurassic. They developed new but preliminary global reconstructions that will be tested by paleoclimatically sensitive sediments (evaporites, coal, and tillites). A similar effort was undertaken by another working group whose focus was the Precambrian. Although uncertainties are generally larger for the Precambrian, the group was pleased to recognize and tabulate a greater than 50% increase in paleomagnetic poles with the highest-quality ratings over the past decade. Such rapid advances in robust data generation bode well for increasingly accurate supercontinental and paleoclimatic reconstructions in deep time. This was the first NPW to incorporate themes on geomagnetic field modeling and numerical dynamo simulations, bringing together researchers studying observations and those modeling the geomagnetic field and running simulations. For example, one working group collated and assessed paleosecular variation and paleointensity data from the Jurassic and Cretaceous periods and reproduced, qualitatively, the observed changes in paleomagnetic behavior in a series of numerical geodynamo simulations. The Research Council of Norway, the Centre for Earth Evolution and Dynamics, the University of Iceland, the Letterstedtska Föreningen, and the International Union of Geodesy and Geophysics funded the workshop. The Advanced Geoscience Instruments Company and Magnetic Measurements Ltd. also provided support. Citation: Brown, M. C., T. H. Torsvik, and L. J. Pesonen (2018), Nordic workshop takes on major puzzles of paleomagnetism, Eos, 99, https://doi.org/10.1029/2018EO094671. Published on 23 March 2018.